MD Consultancy is pleased to announce that it will be taking part in the Economic mission to Sierra Leone, Liberia and Guinea headed by Lilianne Ploumen, The Dutch Minister for Foreign Trade and Development . The mission is scheduled to take place on 5-8 July 2015. 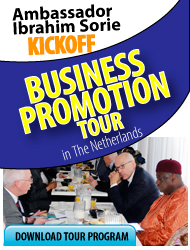 MD Consultancy (MDC) will be meeting Sierra Leonean and Dutch companies that are interested in developing business in the other country. Led by a multilingual business consultant with a strong network in both countries, MDC can add value to new business development in either country. Secondly, MDC want promote the business and aspirations of participants of our online entrepreneurship programme in Sierra Leone through ensuring that a selected few are represent during the network meeting with Dutch entrepreneurs.